Click here for family stories and photos. Scouting games and activities and Cub Scout pack meeting ideas. 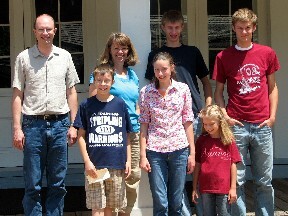 This our family in 2009 in front of the Newell K. Whitney store in Kirtland, Ohio. Our 4th great-grandfather Andrew L. Allen lived here and shopped in this store. His name is on the first page of the store ledger in the room behind us. Photographs, design ideas, and tips for the Idaho TECH Mars Rover challenge. David's web site for National History Day. It won first place in the Idaho state competition.